Houdini 17 was released today and we’ve launched Houdini Contexts, the first in our series of brand new courses covering the application. We also launched our new podcast this week with episode number one of The Render Queue. In it, John Montgomery chats with Andrew Lowell about our plans for a full curriculum of Houdini courses coming out over the next 12 to 24 months. Learning Houdini can seem like a daunting task, especially if it’s the first time you are using procedural workflows. The many different ways in which one effect can be achieved combined with the vast amount of nodes and low-level manipulation of 3D geometry that Houdini offers is very hard to understand in the beginning. If you want to build a strong foundation not only in learning the software but also in understanding how to work procedurally, this is the course for you. This new course (full details available here), taught by Jeronimo Maggi, will give you the necessary tools to be able to work procedurally and learn to develop your own solutions and tools. By the end of the course, you will feel comfortable in building your own setups in Houdini 17 and be able to follow more advanced tutorials. 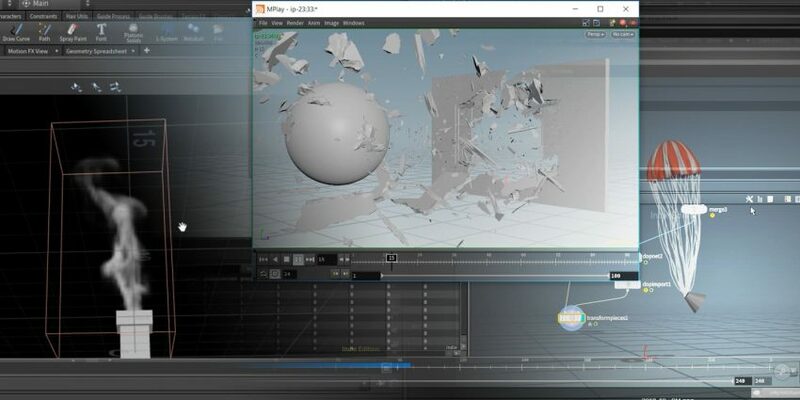 All the concepts will be introduced through the use of examples you would normally encounter in a production and have a procedural nature that would make them very difficult to create in any other software. Maggi started his career as a 3D generalist and has been working with Houdini as an FX Artist for the last 4 years. He worked for several years in the education field teaching Houdini and currently works in Method Studios Vancouver as an FX TD. Aside from Houdini, he also programs in Python and enjoys creating tools to speed up workflows.